Spinners such as the Blue Fox Super Vibrax are not meant to mimic a fish’s prey, as most lures are. While that may seem strange, there is a reason these go-to lures do not have to mimic neither a bait fish or a crawdad. They are reaction strike baits. As an angler slow-rolls one of these Vibrax spinners close to cover where a lethargic fish may be hiding, the fish will first hear the vibration, then see the flash of the lure. To the fish, this is something strange. It could be something coming to invade his hiding space. If nothing else, it makse him curious. When fish are curious, and they want to check something out, they do this by taking a bite. With the super-sharp VMC treble hooks on these lures, that spell trouble for a curious fish. The difference in a Blue Fox Super Vibrax spinner versus others is the internal rattle. Fish have what is called a lateral line. They use this line to sense vibrations in the water. It helps keep them from danger and also lets them know if something tasty is about to swim by. With the internal rattles in the Vibrax, they will feel the vibration, but also hear the rattles. With a machines brass body, the rattle sounds crisp and clear under water, carrying further to the waiting fish. Once the lure is close enough, the fish will see the flash of the French style blades and he will be on it. Spinners like the Blue Fox Vibrax are a great choice when fish are not actively feeding. Because they are reaction strike baits, they will produce fish when other lures fail. Other lures are meant to look like prey. But if a fish is not hungry, or not actively feeding, there is little chance he will go for one of those lures. However, it a Vibrax spinner happens to roll slowly by, he will likely come out and check it out. With the Vibrax, the strike zone is a bit larger because it is louder than no-rattling spinners. It can call fish from further away. Still, anglers should attempt to get as close to cover as possible when throwing Blue Fox Super Vibrax spinners. These spinners come in a variety of sizes and colors. They are a bit more compact than a Mepps spinner, so an angler may find the need to upsize for the same results. For instance, if an angler normally uses a #2 Mepps for panfish, for instance, a #3 Blue Fox Vibrax may be exactly what is needed. For the most part, bigger baits will attract bigger fish, but that is not always true. Big baits, however, will definitely be too big for smaller fish. 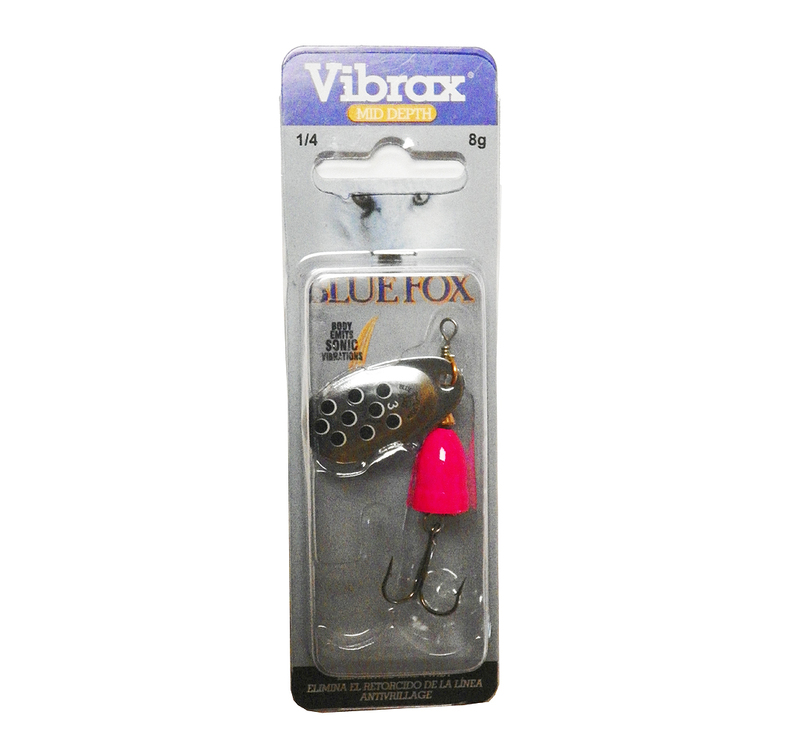 A #3 Blue Fox Vibrax will be perfect for larger panfish as well as smallmouth bass and some walleye. Nothing is more fun than fighting a smallmouth on an in-line spinner. They are very strong fish and it requires some finesse to get them to the boat with that small, but incredibly sharp, VMC treble hook. Fish these baits around brush piles, lay downs, docks and along weed edges or over the top of weeds. Anywhere fish can sit and hide when they are not feeding is a prime target for a Blue Fox Super Vibrax in-line spinner. Fishing Bead Lures? How do they work? Previous story Enhanced Fishing Techniques. Why Should You Use Lure Scents?